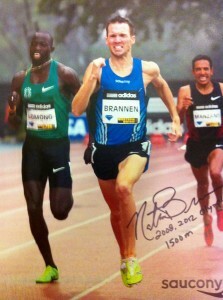 Nathan Brannen is a 2x Olympian for Canada in the 1500m. Born in Cambridge, Ontario, Brannen began competing in Track and Field at a pretty young age. Before Brannen had graduated high school, we had already signed a full-athletic scholarship with the University of Michigan and also began 1 of only 7 runners in North American to ever break the 4-minute mile barrier as a high schooler. After a very successful collegiate career at the University of Michigan which included 4 NCAA and 6 Big Ten titles, 11-time All-American honors in Track and Field and Cross-Country, 3 NCAA records, 2 Canadian Records, and the 2003-2004 University of Michigan Athlete of the Year award he continued onto the professional running circuit. Here are some of the givebacks you can get by helping Nathan reach his pursuit: Brannen grew up with aspirations of being an Olympian but he watched his dreams quickly fade away when he got injured only 2 months before the 2004 Athens Games. Determined to come back even stronger, he was ready for the 4 year road ahead to Beijing. In the fall of 2007, only 9 months prior to the 2008 Beijing Olympic Games, Brannen suffered a very severe injury and was told by doctors that he may never competed again. On Nov 30, 2007 he underwent back surgery to fix a herniated disc in his back and on January 1, 2012 be started running for the first time since surgery. After a long road back with a lot of ups and downs, Brannen qualified for his first Olympic Team only 1 month prior to the Games. Brannen wasn't satisfied with just being a 1x Olympian and was ready more than ever to come back and compete once again at the 2012 London Olympic Games. After his best build up ever, he knew he was a threat for medal. His confidence and fitness level was better than he had ever experienced and he was coming into London with 2 goals in mind, getting to the final and going after a medal. Brannen made it through the first round with relative ease and was more than ready for the semi-final. Brannen seemed very composed and in great position to make his first Olympic final when with only 600 meters left in the race he was tripped and fell to the track. In a split second he watched his Olympic dreams crumble before his eyes. "I didn't even know what happened but I knew all I could do was get back up and fight as hard as I could to get back into the race. 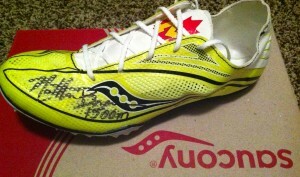 I felt like I could hear a gasp from every Canadian watching from home as I hit the track," said Brannen. Brannen runs with pure guts and perseverance and is more than ready for the 4 year road ahead to Rio. London was a hard Olympics to take but he isn't just going to Rio to be a 3-time Olympian, he is ready to come back and do something special. “Without running I may have never known how much strength I have and my tenacity to overcome life’s struggles. It is these struggles that really allow a person to see who they really are. I’m a fighter and always will be no matter what life throws at me. You will be a part of the team who will help me reach the top and for that I am eternally grateful. A personally autographed card made out to you showing my thanks. Personal skype conversations about running/training/coaching and a signed thank you card. I will design a shirt with donators names on it, wear it while at an event for photos, autograph it and send it to you! Skype conversations and a signed thank you card. One signed track spike, a great conversation piece for your friends and family and a custom designed and autographed shirt shirt. Skype conversations and a signed thank you card. In addition to getting all of the givebacks listed above, I will train for a day with you.